Thank you to all who attended the 72nd Annual Newbold On-Property Sale on Thursday 22nd September and congratulations to all buyers. Rams met strong demand and producers valued the excellent Lambplan ASBV’s available. It was obvious that Newbold’s breeding emphasis for commercial profit drivers is highly valued by commercial lamb producers. Newbold has continued its success in lamb production classes in the show circuits, this year most notably the winning the Interbreed Championship Lamb Production Pair at the Adelaide Royal Show. Strong demand was evident from Lot 1, a big solid son of Meat Elite sire Hillcroft Farms 497/13, with phone bids coming from interstate. Newbold 116/15 was eventually purchased for $5250 by Richard Maas from Gilmour Station, Lake Bathurst NSW. Craig Trowbridge, Ceduna purchased Lot 6 a very big sire for $3000. Strathdownie Props purchased two stud rams at $3000 and $2500 through long time buyer Kevin Norman. Peter Schiller Karoonda also purchased two rams for $2000. Poll Dorset Flock rams topped at $1800 with the first 30 rams all selling for greater than $1000. Later sales provided a great buying opportunity to average prices. Major buyers were William Hurn with 12 and Bill Pearce with 13. Repeat buyers from the South East Ivan Hunt, Ron Cook and Stuart Oliver also purchased 6 rams each. The outstanding line of White Suffolk rams sold strongly to a mix of repeat and new clients. A number of rams made the top price of $1600. Bruce McCallum put together a magnificent line of 7 rams. Boundrina Pty Ltd another great team of 13 rams. Other strong buyers were Tom Quinn, Mich Dittrich and Chris George. 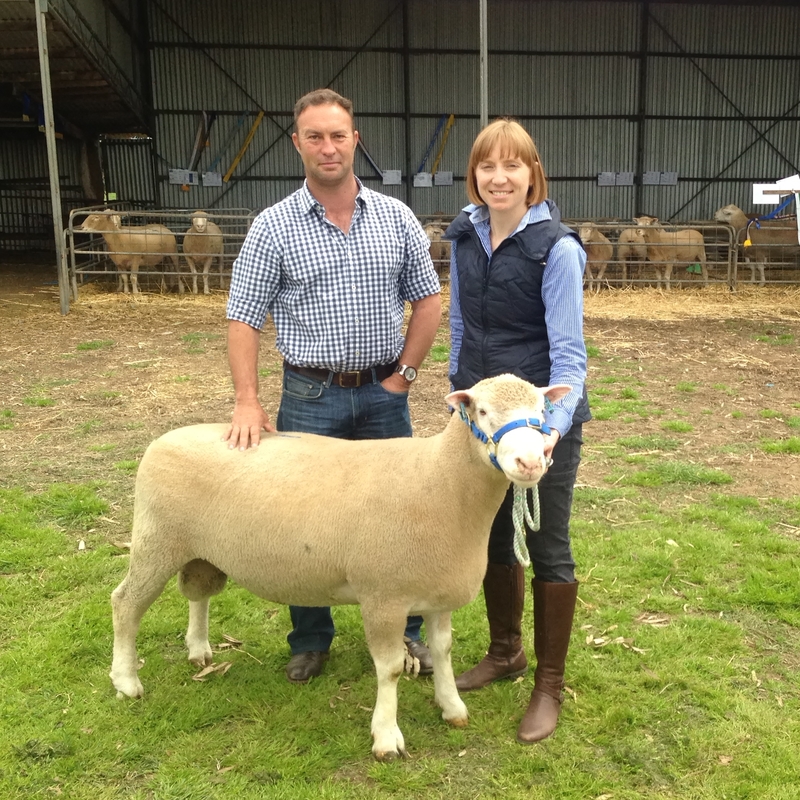 Dan Robinson from Kangaroo Island purchased all the Texels and Texsets for use particularly with his maiden ewes. With thanks to all bidders and under bidders as well as the Landmark Gawler - Riverton team for facilitating the sale. Kate with Richard Maas, Gilmour Station NSW and top-priced ram Newbold 116/15 purchased for $5250. Read the Stock Journal report here.